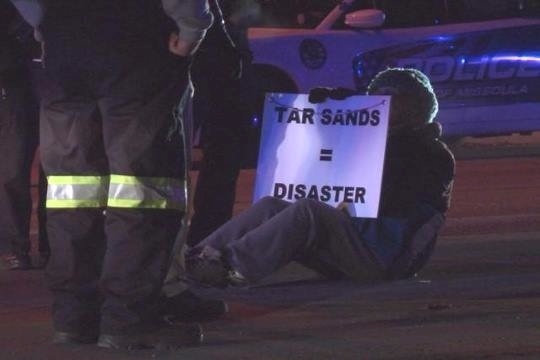 When activists and citizen groups learned that heavy haul companies were planning to transport tar sands processing equipment through Missoula, Indian Peoples Action became the driving force for protest. On a cold winter night on January 22, 71-year-old grandmother Carol Marsh sat down in front of a megaload-sized vehicle hauling tar sands processing equipment through Missoula, Mont., en route to Canada. While more than 40 other protesters watched from the street’s edges, Marsh informed the police traveling with the load that she did not intend to move. After about five minutes Marsh was arrested, having temporarily delayed the load and driven up the cost of transporting it through Montana to the tar sands region of Alberta.